David Beane says he found this pictures on Ebay. He bid on it but lost. Someone out there has a incredible picture of the town’s yearly years. 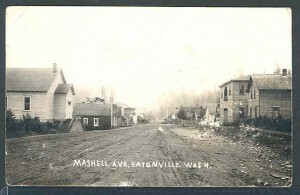 The road was still dirt, and many of the buildings are gone today, but the Methodist Church (the left) still stands, along with a few others. If you know anything more about this image, please feel free to comment.